Update, 1/16/12: Note that because of the snow this week, the second meeting scheduled for January 17th has been cancelled and will be rescheduled for a later date; click here for more details. 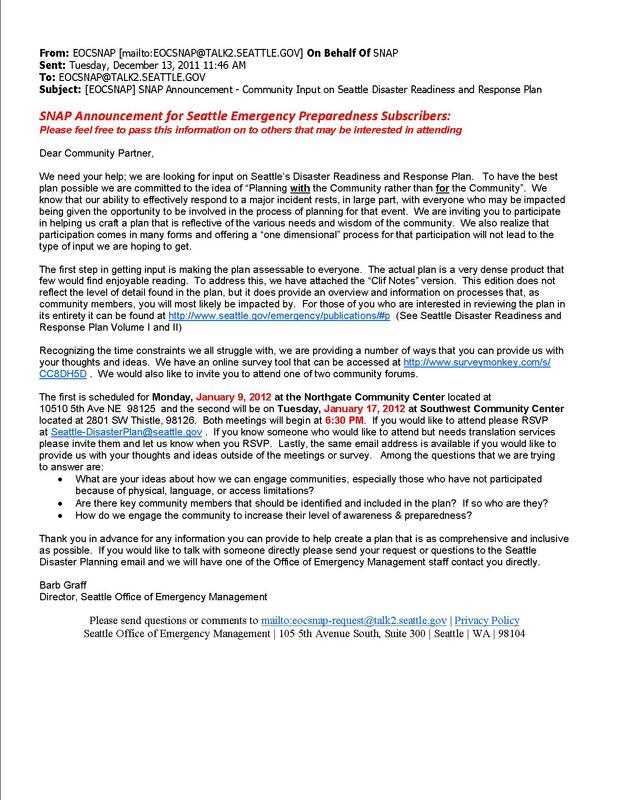 The Office of Emergency Management is seeking feedback on the Seattle Disaster Readiness & Response Plan. West Seattle: Tuesday, January 17, 2012 at Southwest Community Center (2801 SW Thistle, 98126). If you would like to attend, please RSVP at Seattle-DisasterPlan@seattle.gov. Both meetings will begin at 6:30 PM. Following is the full announcement that we received (in .jpg format), followed by a version of the same in .pdf format. Below those, we’ve included links to the condensed overview of the disaster plan and a link to the (very large, 2 volumes) full version. This entry was posted in Announcements, Community Forum, Events and tagged announcements, disaster preparedness, Seattle Disaster Readiness and Response Plan, Seattle Office of Emergency Management. Bookmark the permalink.